Rachel Rogers and David Supple. Rachel Rogers celebrated her eighth annual 29th birthday on Friday, Sept. 14, with approximately 50 of her closest friends. 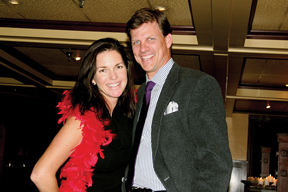 Hosted by her parents Doyle and Barbara Rogers of Palm Beach, Fla., the evening affair took place at The Tavern at the base of Aspen Mountain. The invitation suggested guests come “dressed to kill” so all got dolled up in their finer threads from their closets as well as from the racks at local boutique The Gallerie. The party started outside on the terrace with Latin music piped in on the speakers, then moved inside after dark. A buffet of bruschetta and other hors d’oeuvres was served throughout the evening followed by chocolate and vanilla cupcakes.